Confirmation is the third in the trinity of the sacraments of initiation into the Catholic Church. The three sacraments are Baptism, First Communion, and Confirmation. 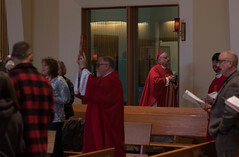 Confirmation is not the end of the process of learning about our faith, it is only the beginning of a life long journey where we are called to walk with the Good Shepherd and with our brothers and sisters in Christ. This year we had four young women receive the sacrament of Confirmation on May 20, 2017. These four young ladies, Molly, Jasmin, Kiana, and Lilly, are all active members of our local community and a blessing to us all. At the Cathedral we confirm students during the 8th grade year of school using a two year formation process that starts in 7th grade. During our two year journey with the middle school youth group (MSYG) we learn about the church, about the sacraments of initiation, about the gifts of the Holy Spirit, and the gifts of community. The three key elements of formation are Community Service Projects, Education, and Social Nights. During the community service projects youth learn about and use the Spiritual and Corporal Works of Mercy. Examples of projects are serving meals to the patrons at the Glory Hole soup kitchen, collecting items for the Aware Shelter, Front Street Clinic, and Glory Hole based on their requests and needs, cleaning up around the Cathedral, visiting seniors at the Pioneers’ Home, sorting food at the Southeast Alaska Food Bank, helping the Martha’s Ministry and Knights of Columbus with special events, and helping with the younger children at Catechesis of the Good Shepherd events and prayer services. The education portion of the middle school youth group focuses on learning about the church, the sacraments, the saints, and exploring their Catholic faith (prayers, teachings, and what it means to be Catholic) using the Dynamic Catholic “Decision Point” materials, other Confirmation preparation materials, along with some of the Catechesis of the Good Shepherd Level 3 materials that enrich the learning experience. MSYG also includes social fun nights and retreats where the youth get to enjoy their community and build relationships with each other. Some events during the fun nights are field trips to the climbing wall, bowling, and movie nights at the Cathedral Hall. Every year there are two retreats offered. One is in the fall, a “getting to know each other retreat,” and in the spring is we have our Confirmation retreat to prepare our eighth graders for the sacrament while being supported by their middle school community and catechists. This retreat provides opportunities for communal and individual prayer, discernment, and Reconciliation. Through this process we, as catechists, hope and pray that our young people learn what it means to be a full and active participant in our community. 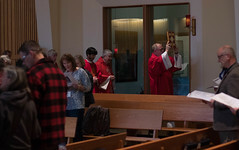 How in this sacrament there is an element of choice, as in choosing to be a full and active member of the Catholic Church, our community and the global community of Catholics. But we also want them to learn that a large element of the Sacrament is the grace that God bestows on us. There is nothing that we can “do” to make God love us, it is by Jesus’ grace that we are loved. We, as community, are still called to help each other and apply the spiritual and corporal works of mercy to help build up the body of Christ in our brothers and sisters. Please continue to pray for these young ladies and all our young people, as they continue their faith journeys with our Southeast Alaska Catholic communities.